To catch everyone up, Chris McNutt was the treasurer for the "Vote NO" PAC in Richardson ISD, which led the campaign against the RISD borrowing money for school construction and maintenance. That's just one job Chris McNutt has had. Other gigs include running a political consulting firm that he says helped elect State Representative Jonathan Stickland. 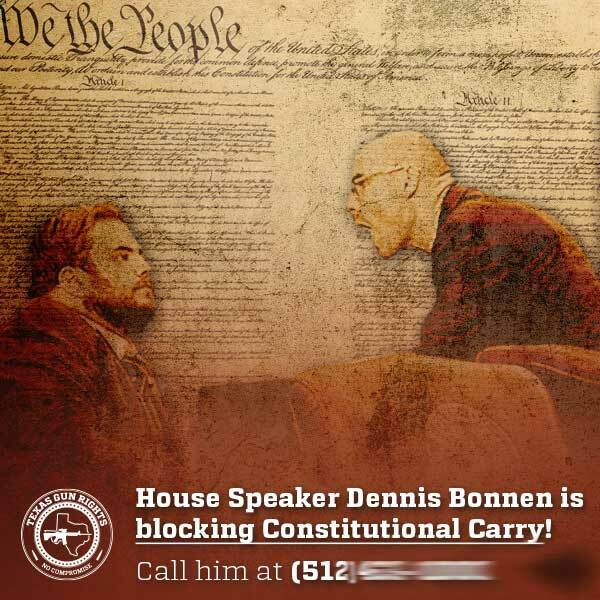 That's Stickland in the graphic above, being schooled by Texas House Speaker Dennis Bonnen. Maybe not coincidentally, Stickland was the only Texas House legislator to vote against House Bill 3, the bipartisan bill (148-1) that adds $9 billion to the public school finance system. Besides funding schools, what else is Stickland against? Any sensible gun regulations. That brings us back to Chris McNutt's last appearance in these pages. It was an article, "Guns in RISD and the City of Richardson", commenting on Time magazine's cover story on guns, which featured not only Chris McNutt, but Richardson City Council member Mabel Simpson (a relative of McNutt), brandishing one serious-looking gun with a look on her face that could kill all by itself. 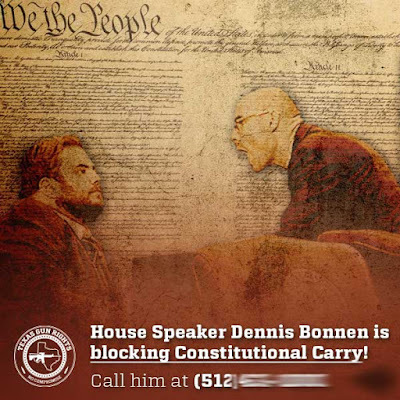 McNutt's campaign for so-called "Constitutional Carry", the right to carry guns, concealed or open, anywhere in public or private, without a license, is what got him on Time's cover last year and this year took him to legislators' home neighborhoods to make his point. He thinks the solution to the gun violence problem in America is more guns. Guns everywhere. Actually, I'm not sure that reducing gun violence is a goal of his. He just seems to be for guns, regardless. Thankfully for the rest of us, the "Constitutional Carry" gun bill is going nowhere in the Texas legislature this session. According to the Texas Tribune, Stickland said he was "saddened by the act of a few individuals that have stolen the conversation about legislation that I deeply care about. … There is a right way and a wrong way to influence the legislative process. … It is never okay to target their homes or personal businesses when you know they are not in town." I do have to hand it to McNutt on one thing, making Stickland sound like the voice of reason in this case. Richardson's own Chris McNutt doubles down on drawing attention to himself by getting into "pointless macho posturing" with Texas Speaker of the House over guns.